National Children’s Dental Health Month Is periodontal disease contagious? So much of parenting is a balancing act. Making sure your child has enough play time and enough nap time. Crafting meals that are both healthy and appealing. Making sure every dental product you use is both effective and safe. While Dr. John Witte and our team can’t recommend the perfect bedtime story, or tell you why your child just won’t go for that delicious steamed broccoli, we are more than happy to discuss the very best ways to promote healthy, strong teeth. Should fluoride toothpaste be part of your child’s dental routine? For many good reasons, the answer is yes. Our enamel is the strongest substance in our bodies, with the highest concentration of minerals, but it is not indestructible. The bacteria that live in our mouths create acids which attack our enamel. Weakened enamel leads to cavities. Fluoride is a mineral that makes the enamel surface more resistant to these acids, and can actually help our enamel repair itself in a process called “remineralization.” Fluoride helps prevent cavities and makes teeth stronger, and those are benefits that will last your child a lifetime. Fluorosis is a condition that can sometimes develop when a child has been exposed to too much fluoride while the adult teeth are developing below the gum line. (Around the age of eight, children’s teeth have finished forming and are not at risk.) Fluorosis is not a disease, and doesn’t harm teeth, but can lead to faint streaks in the enamel. While this streaking is usually white and subtle, it can sometimes be darker and more noticeable. Teeth discolored by fluorosis can be treated cosmetically, but prevention is always the best option. Talk to us about using fluoride toothpaste when your baby’s first teeth start arriving. If a very young child is at risk for tooth decay, we might recommend early use of fluoride toothpaste. And for these small children, younger than the age of three, a small smear of paste (about the size of a grain of rice) is sufficient if needed. Swallowing fluoride products increases the risk of fluorosis, so make sure to use a very small amount of paste. Because young children can’t understand the concept of rinsing and spitting, you always want to make sure the amount of toothpaste you use is age-appropriate even as they get older. From ages three to six, a pea-sized dab of toothpaste is enough. Children should not use fluoride rinses or supplements unless recommended, and should be monitored to make sure they spit out fluoride toothpaste or rinses after brushing. Most drinking water already has natural levels of fluoride, which normally aren’t a problem. If you are concerned about high fluoride levels in your local water, talk to us. If your water has higher levels of fluoride than normal, you can minimize consumption when your baby is young by breastfeeding, using non-fluoridated water for mixing with formula powder or concentrate, or buying prepared formula. If your child is a toddler, don’t add fluoride rinses or supplements unless they are recommended by a dental or medical professional. 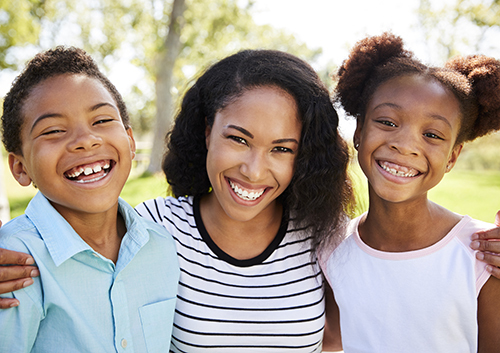 Talk to us during your visit to our Arlington, TX office about protecting your child’s teeth. We are happy to help you find just the right amount of fluoride to keep young smiles stronger and more resistant to tooth decay. Healthy teeth in a beautiful smile—that’s a perfect balance!